A sentence is a group of words that is arranged so as to make a complete sense. i.e., when a group of words sitting in a proper way expresses a certain meaning then it is called sentence. 2. Fat is a great factor. 4. Payout is ready for devil. 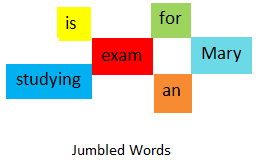 Let us look at this group of jumbled words to understand about the sentence. Rearrange these jumbled words in different order to form a complete sense. Now, the same group of six words makes complete sense. Such a group of words is called sentence. A sentence ends with a full stop (. ), a question mark (?) or an exclamation mark (!). A sentence may be single worded or multi–worded. It is because while we are writing we use many words but when we are speaking we often use single word. Sometimes we use verb less word or group of words for verbal communication. A sentence may not denote a complete sense as a sentence may be changed into big from small. (i) A man is eating. (ii) A thin man is eating. (iii) A thin man is eating banana in his breakfast. If we discuss comparative literature, we see that in Sanskrit grammar a sentence has three parts. These are – desire, eligibility and position. (i) A man is walking. (ii) A man’s desire is walking. (iii) He can walk it is his eligibility. These words are placed in a balanced manner it is its position. Single worded word: come, go, hold. (ii) Nita Singh (verb less). 1. A sentence has two parts-naming part and telling part. 2. A sentence denotes a complete meaning. 3. Sentence may be big or small. 4. Every sentence’s beginning is capital letter. It should end with a full stop (.). 5. Sentence’s I is always capital. 6. A pronoun’s first letter is always capital. 7. According to English grammar the words should be arranged in a proper way. In this sentence, even one word makes a sentence. In this sentence, two words also make a sentence. In this sentence, three words make a sentence. 4. What does Elizabeth write? In this sentence, four words make a sentence. 5. Elizabeth pen with writes. In this sentence, four words do not make a sentence. Group of word or words from sentence 1 to 4 make complete sense. Hence these are termed as sentence. Group of words in sentence 5, does not make complete sense. Hence these are Jumbled Words so these words are not put in their proper order. Now we will discuss about assertive sentences, interrogative sentences, imperative sentences and exclamatory sentences along with the examples. A sentence that says or states something is known as assertive sentence or declarative sentence. An assertive sentence can either be affirmative or negative. 1. We play badminton in the evening. 3. Lady Gaga sings well. Note: We put a full stop (.) at the end of an assertive sentence. A sentence that asks a question is known as interrogative sentence. Note: We put a question mark (?) at the end of an interrogative sentence. A sentence that expresses a command, a request or an advice is known as imperative sentence. 1. Show me your homework. 3. Give me a pencil, please. Note: We put a full stop (.) at the end of an imperative sentence. A sentence that expresses some strong feeling is known as exclamatory sentence. 1. What a grand building! 2. How nice you are! 3. What a lovely flower it is! Note: We put an exclamation mark (!) at the end of an exclamatory sentence.